Through out time there has been an assortment of stories on how a person becomes a werewolf. Sometimes it’s a curse caused by a single bite, sometimes punishment brought on by a God’s wrath, or by what today’s post is about, a spell. So back in the day, like, way back during the Middle Ages people were big on trying to harness the powers of nature. Belief in the supernatural was common between everyone and whether caused by God, demons, or natural forces – magic and alchemy were widely explored. 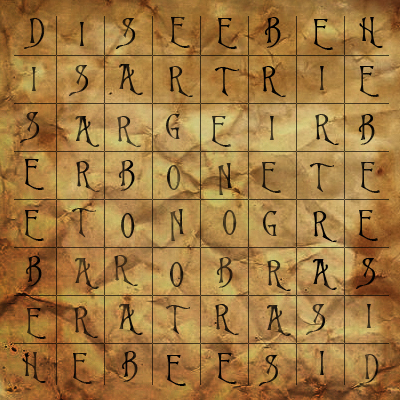 This part you have probably already learned from Harry Potter, but back then spell books were known as “grimoires,” and they were usually devoted to black magic. The Book of the Sacred Magic of Abramelin the Mage by Abraham the Jew (that’s the title he went by, not something I just threw in “oh and he’s a Jew”) was written in 1458, then translated in 1898 by S.L. MacGregor-Mathers. In this book is a description on a long and complicated ritual. This ceremony is designed to evoke the Holy Guardian Angel, after that the magician will gain the power to control the hierarchy of demons. He is then able to use these demons for many reasons, like transforming from man to wolf. Wicked. This transformation was achieved by writing the square on a piece of paper (like the one pictured on the left), showing it the man, and suddenly bringing it into contact with his body. The transformation will happen right away. However, the grimoire cautions us that what is shown is an illusion. To return the wolf to human form, the magician places the square on the wolf’s head and hits it with his wand (ouch). Now other than a cool party trick, it’s hard to see how this is of any use. Unless somehow new strength and power is also mixed into the spell, causing the transformation to be more. There you have it. A real spell from an ancient book. A spell that is said to be real but I’ll leave you to believe it or not.